It’s 2016 and the UEFA Euro games are in full swing! It hasn’t just been the players and the fans that have been offering us all the highlights though, one of the stadiums in France has also taken centre stage! 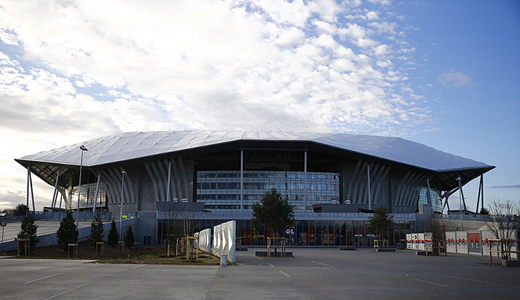 Situated in Lyon, the “Stade de Lyon” has been built for the Olympique Lyonnais football club and has been hosting the Euro games. Built by the masterminds behind the London Olympic Stadium, Populous, construction began back in 2012 and was completed in January 2016. One of the most impressive features that the stadium possesses is the roof. Constructed from an innovative material called “Precontraint TX30”, developed by “Serge Ferrari”, the flexible fabric spans over 53,700 square metres and amplifies the noise levels within the stadium. The noise that is created by the fans plays one of the largest parts in creating the atmosphere during a football match and this roof makes sure that they are able to make the most of the ambience that is created. Football fans, especially around Lyon where it is seen as tradition, are renowned for their chanting. Populous seems to have respected this tradition and created a stadium that allows them to make the most of this and achieve the best possible experience during matches. The roof traps the noise that is created by people inside the stadium without excess noise leaking out. I am sure the neighbours are loving it! Forget insulation, I think I need some of this at home so I don’t have to worry about bothering my neighbour with my poor music choices! 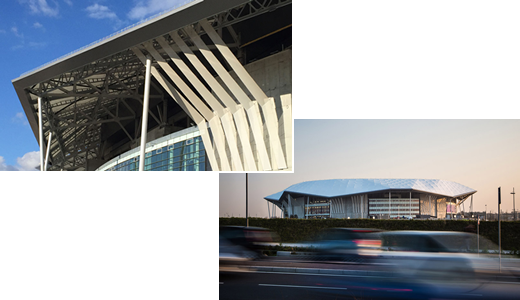 The roof spans over the main structure of the 4 level venue, providing shelter for guests who are waiting before and after football games. It is the extended roof that has led to a lot of people mentioning that the structure almost looks like a “turtle shell”, which reminds me of that childhood myth where the noise of the ocean is still trapped within a sea shell and that you can hear it when you rest the shell against your ear… The stadium roof structure amplifying the noise inside but not allowing it out almost seems to create the same thing! Consisting of 59,186 seats, of which 6000 are business seats and 105 lodges, the designers have made sure that the stadium’s guests are all catered for comfortably. Throughout the first and second floors there are fast food and restaurant venues that are easy to get to around the masses of fans. Decreasing the feeling of being “cramped” due to large crowds will only hamper the atmosphere for the guests, Populous has kept this in mind allowing the fans to be able to have some space and room to move. The venue will be hosting 6 games during the Euro 2016 games, but the stadium was not designed and built just for these games. The building has been fitted out to cater for other sports, such as rugby, as well as events and concerts with the intention of re-fitting every couple of years. The amenities that have been offered at the stadium are due to the fans and visitors having “higher expectations”, especially with the rise of ticket prices for the Euro 2016 games and the design of the stadium has achieved just that. 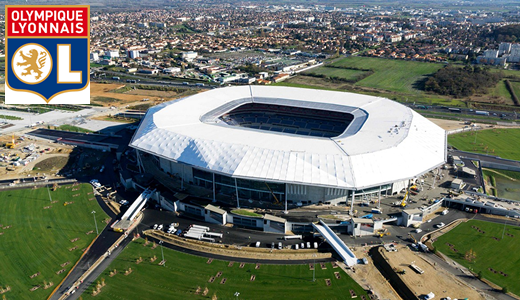 Offering the best possible experience for the public, this is a stadium that is not only making Lyon and France proud, but one that is certainly going to “wow” the rest of Europe, if not the World!